Without doubt, i would be lost and in the deep end without the help of my HUD software tools. There are other ways of identifying weak players, but by using these tools I can have a quick clear insight into who and what I am going up against. A good rule of thumb I abide by when using this software is that every player whose VPIP percentages are above 33% is classified as a weak opponent. My HUD gives me a clear indication of these type of players by highlighting them in green, giving me the OK to attack. If I find myself within a table that doesn’t have any of these players in its seats, then my cold feet tell me to find a new one. Also, if the poker room I play at doesn’t have at least 6-8 tables with players like this, my best bet is to look for a new poker room. I always prefer playing when there is at least one player with a VPIP above 50% at my table, and these types of players can most commonly be found during European peak hours. In cases like this, sometimes we can feel we are left in the dark, but if we choose to rely on our observations and instincts, we can still identify these loose players. 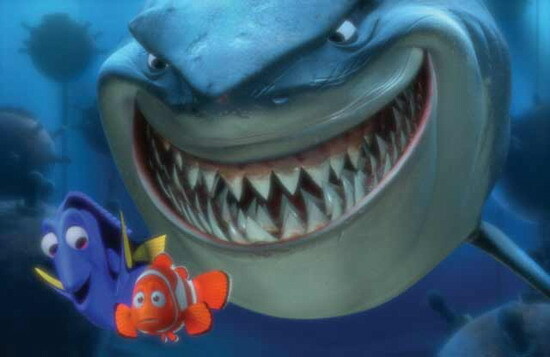 It’s still better to be a grinning shark with pearly whites, eh? The first tell-tell sign of a loose player is how much money they bring to the table. Regulars and good players always tend to sit down with around 100 big blinds, whereas weaker players usually risk less money at a time (they might not have a bankroll suiting the stakes they play at). The best sign is if a player sits down with an uneven amount of money (for example, $63.45 at a $100 table), because this means that this player is probably on a serious tilt, and tries to lose his whole bankroll as quickly as possible. Flop-viewing percentages of these players are usually very high. It is also a good sign if a player doesn’t wait for the big blind, but posts it as soon as they sit down at the table. Since online poker is exceptionally fast, there is no need for posting the blinds when out of position. Anyone doing this is usually a gambler or a newbie which means they are ready to easily lose money. It is not gospel or written in stone, but it can be a definite indication of what type of player you’re up against if you have a look at their nationality. On numerous occasions, when all else has failed to indicate what type of player I am up against, I resort to checking their nationality. With nationality, I usually abide by the rules that if the player is from a meditarrenean country (or France), I put in the money much easier, than if the player resides within the Scandinavian area, for example. The next sign that we can look at is the player’s nickname. If a player has typical poker phrases or slang in their nickname (like SuitedAces and so on) that player is more likely to be a stronger player rather than weak. We enter the room, we have a player at our table, we see how much money the player puts to the risk, we see where they come from and we check if they post the blind out of position and we can also collect some data from their nickname. What else can we use to examine them? Many people don’t think of it, but the chat window is a good indication if a player is weak. If we look through the chat window and find conversations where a player says ’Hi everyone’ or ’Good Luck’, it’s easily presumable that this player is a fish, who is here to focus more on conversation and having a good time rather than winning money. Let’s go a bit further now that we have played a few hands against our opponents. It can be a good sign if an opponent continuously shows their losing hands that would normally be mucked. A good player would never do this, as for it is so time-consuming, as for they usually have multiple tables open at once, with the ’auto-muck’ box checked at all of them. The weak players sitting on the blinds typically show their Aces or Kings, to brag to everybody. If, however, they also show hands like A3o or Kto, this could mean they think these hands are just as good as Aces or Kings. If we have sufficient time, we can also check how many tables our opponent plays at. If we see that the player sits at 12 tables simultaneously, it’s presumable that the player is a regular grinder and this narrows down his range to the best cards only. Whereas, if the player is only seated in one table, chances are that they are a fish. Last but not least, it can be a good sign if someone does not refill their stack on a regular basis. The best players usually press the ’reload’ button before the stack falls below 97 out of 100 big blinds. Whereas, if a player had sat in with 100 big blinds, but only has 55 left, they are in it to lose it all. Finding and attacking fishes is a critical point in order to have a good winning rate. The HUD is a very useful tool for this and is a time-friendly solution, but if we cannot use this for some reason, the key points I have listed above can provide you with an edge over most of your opponents. Apart from the ones I have listed which I have been using throughout my career as a poker player, I am sure there are other ones out there. Feel free to post yours here as well as your opinion on some of mine!